Inspired by his brother, Chef Chamila Galahitiyawa took a liking to the culinary arts at a very young age. Soft spoken and humble in nature the Executive Sous Chef won a Gold and Bronze medal at the 5th edition of the “South India Chefs Association Culinary Competition and Exhibition” held in India. Chef Chamila was part of a four member team selected by the Chef Guild’s committee that travelled to Chennai for the competition. He took part in the “International Cookery” category and presented a 3 course set dinner. 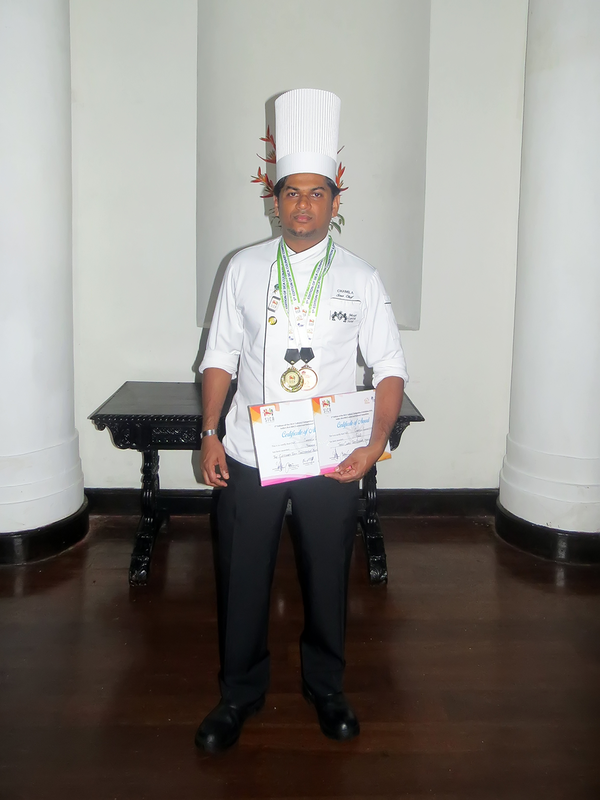 The dish was a fusion of Japanese and Sri Lankan food for which he won Gold. The team took home bronze in the ‘Culinary Team Challenge –Buffet Challenge’. With an overall 21 years experience and 13 years of service at Mount Lavinia Hotel, Chef Chamila is an Executive Sous Chef for the hotel’s catering services division. After the event and in recognition for his achievement , Chef Chamila was offered membership at the Chef Guild’s Committee of Sri Lanka.